I seem to be out to "clean up" my climbed peaks on the Hundred Peaks List by making sure any drive ups actually have a climb. 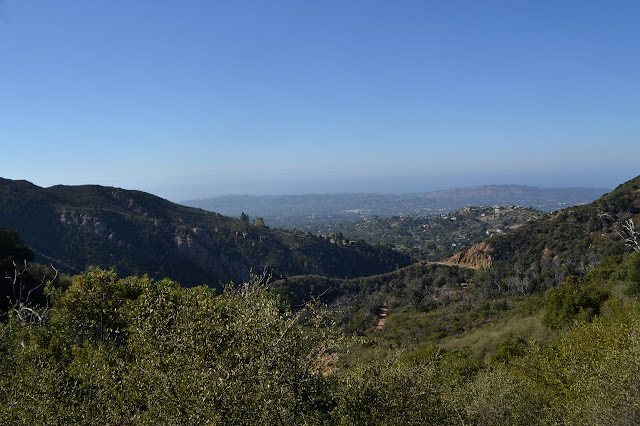 To that end, I plotted a climb up Figueroa Mountain. Sure, I will notice a curious lack of climbers on Peakbagger for the peak as I log it because it is not, in fact, on the list, but let us not get confused by the facts. 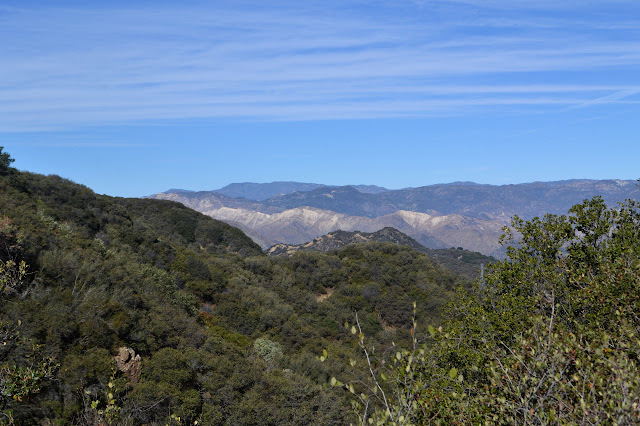 (This seems to be a lesson I am constantly relearning for nearby Zaca Peak, too. These two peaks that sit so prominently in my mind as a Santa Barbara based person just are not that important to those based in Los Angeles. Besides, they are both too short.) 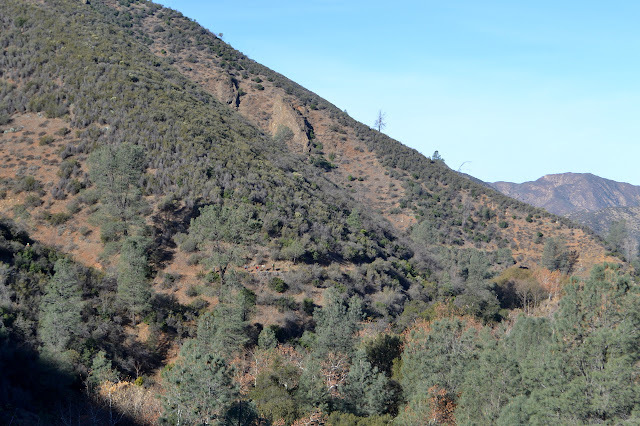 Since I just did Davy Brown Trail, I looked to nearby Munch Canyon. Just have to find it. I know there is an old gate at the start and probably nothing else to mark it. One side of a double gate for an old road and a couple stickers to indicate this is a trail. This is the start of Munch Canyon Trail. Everything starts off wide and flat, not a canyon at all. Grasses scattered with oak trees and one has dropped a large branch on the trail soon along the way. Some walk around it tightly and some wander all the way to the Sunset Valley Trail as it continues on its gentle path to the left. 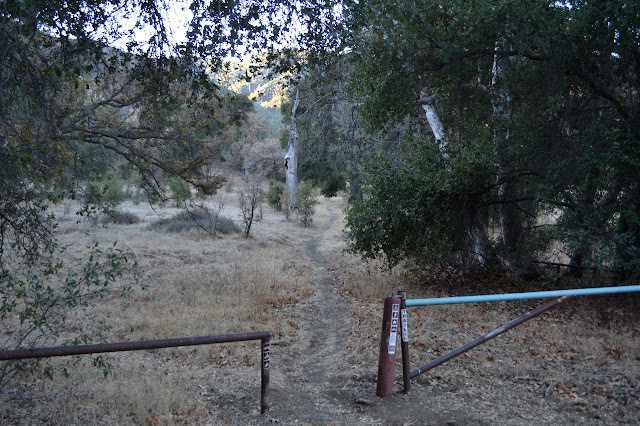 Another gate, marked with a few trail stickers, blocks the old road. A trail wanders off to the right going who knows where while the one I want heads off along the road some more. 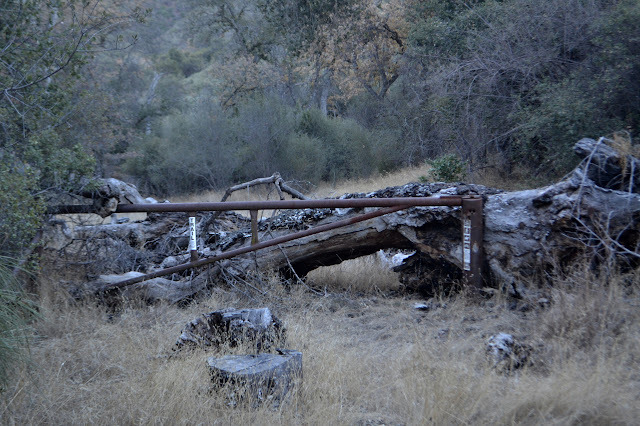 It comes to yet another gate set just behind an older gate and now strengthened by a fallen tree. I have never seen so many gates in such a short length. 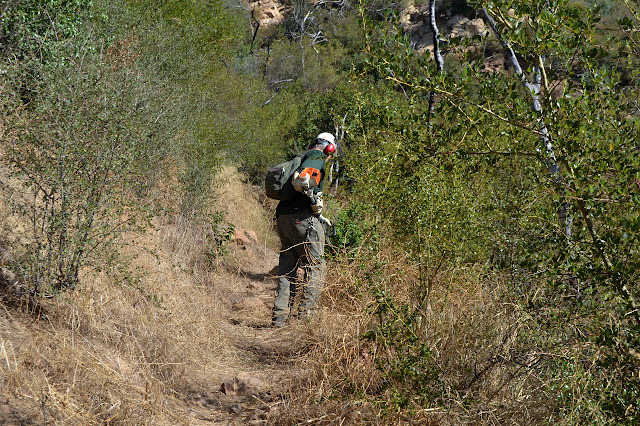 Another unmarked trail heads off to the right through the thick chaparral. How many gates are needed? There does seem to be another old road coming in just before this from somewhere. Past the gate, it starts to look a lot more like a canyon. The tree behind the gate is not the only one along the trail. There is a nice, big one shortly after it right along the trail and decaying quite a bit. I would say it has been there a while, but the walk around trail in the soft dirt does not seem all that well established. The recent trail work has me thinking about what the state of the trail is, and so noting the huge, decaying tree trunk instead of just walking along the side of it. Past it, I cross a dry stream bed, but soon after, I can hear the music of water in the canyon below. Water is getting to be an elusive critter even in the winter. One bit flowing, the next bit dry and not even showing underground water by the plants that grow. Small pools as the water flows through the canyon. After a little listening to the music, the trail turns and starts to climb. Withing the canyon, it has very little memory of once being a road, but as it climbs, it becomes obvious again. Although a road, it is still quite steep. Erosion cuts across it at one spot leaving only the smallest dirt bridge to cross. It turns back and there is a bit of a view. View is not the expected thing for a canyon trail. 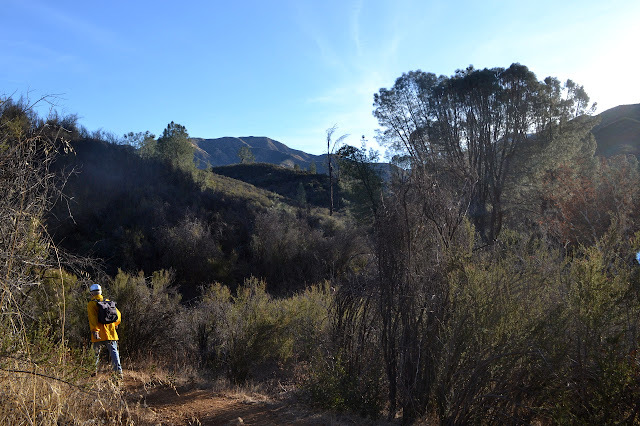 The Los Padres Forest Association has a double header of trail work with camping at NIRA in between and I decided to join in on the fun. There is even tree felling promised for today, but I am in a group that will hike down a few more miles and clean up some tread. Better luck next time. We get to see a lot of the trail, but might miss big trees coming down. We collect some tools and head off for it. Getting on down the trail. 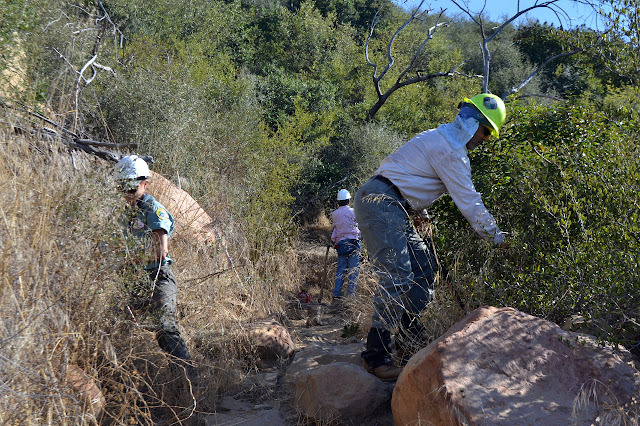 There are five workers across the way on the trail. A little over a mile down is Potrero Camp, which is currently made dangerous by standing dead pine trees. Some gather to make it safe. 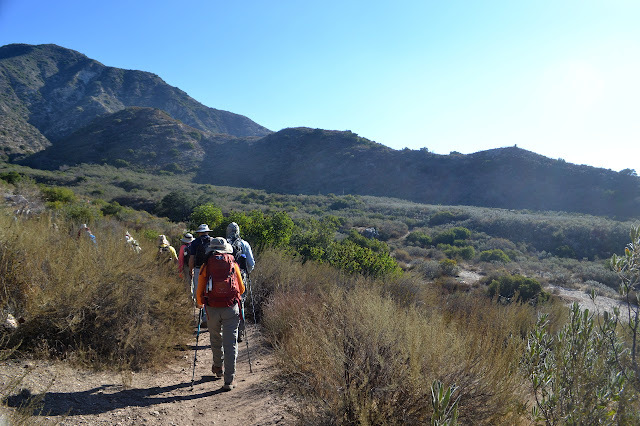 The Los Padres Forest Association has a double header of trail work with camping at NIRA in between and I decided to join in on the fun. There is even tree felling promised for the second day, which I have not yet witnessed. Today is just ordinary sawyer work on downed trees in Lost Valley. Safety gear, safety talk, a gathering of equipment and tools, and we set off up the Manzana to Lost Valley. Everyone here today has done this before and it does not take very long to start. Heading up the Manzana in the morning sun. 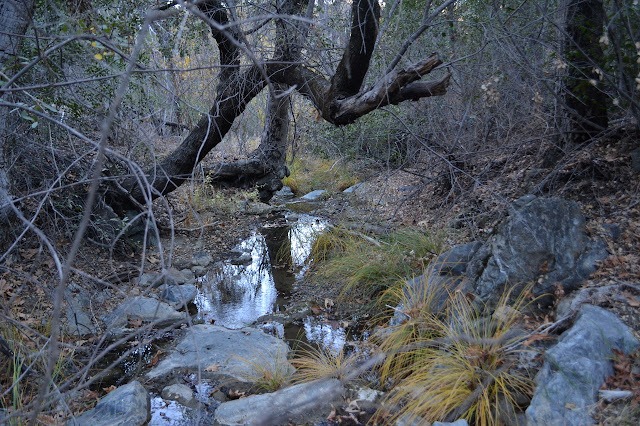 And up along the Manzana Creek, but high enough above to generally not see it. The junction is still hidden up a hill and probably will continue to be for the foreseeable future. Still, someone did manage to accidentally find it once. I wonder how that happened. Maybe got into camp, which is practically on the trail, and decided that was the wrong way then looked around for where it did go. It seems a plausible scenario. I suppose paying close attention at the junctions and knowing what other clues besides a sign might exist to indicate one is at them is sometimes necessary. It is just hard to remember to do when it represents a turn one does not mean to take. We pause a moment until everyone is in sight of the junction and then meaningfully take the turn to climb a little more steeply, at least for a brief time. The old trail is noticeably old road (only ever partly built) through here. The old road bed the trail follows is often quite obvious along Lost Valley Trail. 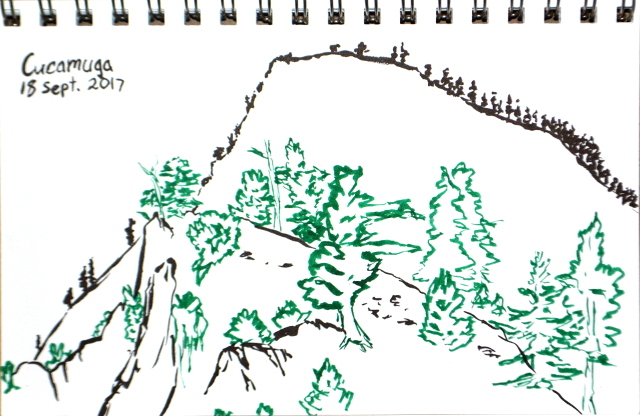 A group of geocachers were heading up Oat Mountain via the canyon just east of the one featured in my first, somewhat more elaborate attempt at the peak. This neatly sidesteps the requirement to poke through some private property wandering right past the ranch house. (Well, I could probably have done the cross country on cow paths up the canyon, which does appear to be park.) This is the more usual route. Getting to the parking requires ignoring a few signs that, as far as I know, were really supposed to be taken down when the park opened to the public. One sign demands that only residents are allowed to use a bridge. Beyond that is a ranch that boards horses and is mixed in how welcoming it is about the public using the road past it. At the end is public parking so the public is definitely expected to be allowed to arrive here. A $5 fee is required for parking, but today there is no envelope to use with the iron ranger. We park at the upper lot to continue up past the locked gate on road that continues to be paved. Views of the ocean over the artificially shaped hills come very quickly. 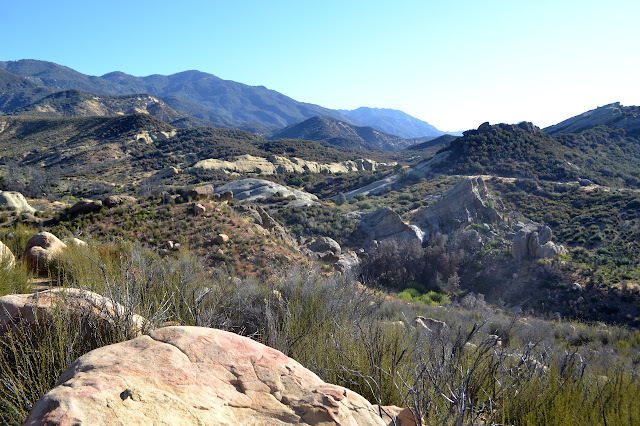 Rocky Peak, which marks a corner on the border between Ventura and Los Angeles Counties. I may have been spending too much time staring at Thomas Fire information and worrying. 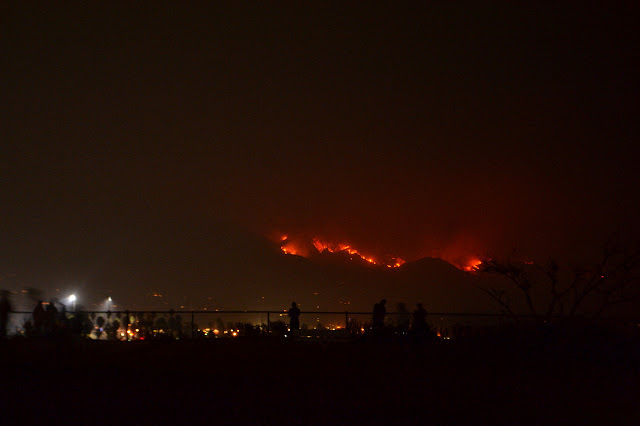 In those first few days, I looked at that footprint and thought this close bit coming at Carpinteria may look threatening to Santa Barbara at first glance, but it is really this bit almost at the furthest side of the fire creeping up Topatopa Bluff that is dangerous to us. That part raged across Nordhoff Ridge one night to breath its menacing breath over the entirety of Ojai and then kept on going. It jumped the highway and started in on devouring the Santa Ynez Range. 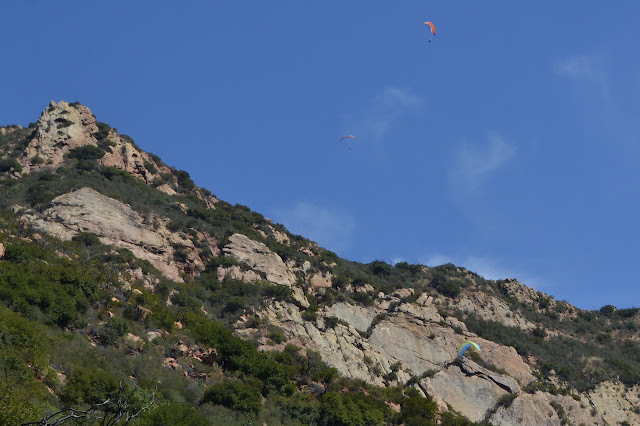 It dropped into Matilija Canyon with a dreadful finality to many homes there. 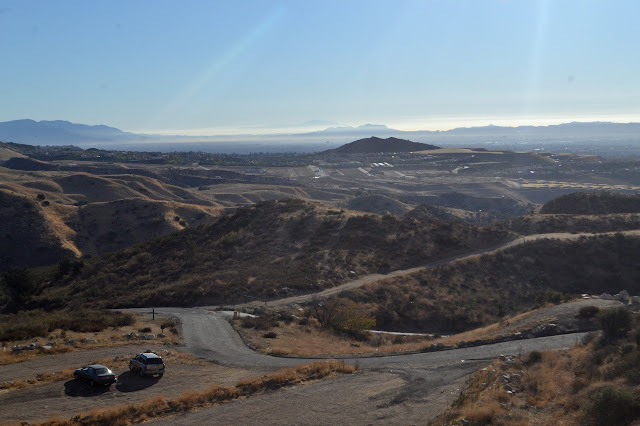 It raged to Romero in another jump sending those in Toro Canyon fleeing on the way, then crept over to San Ysidro. It followed the path I expected and feared it would. People watching Romero flare up a week ago from the west end of Shoreline Park. Flame could be seen above Summerland and Carpinteria as well. It jumped again two days ago. It reached down into Montecito and raged all the way to Gibraltar Road and spotted into Rattlesnake Canyon and Parma Park. These are our city parks! 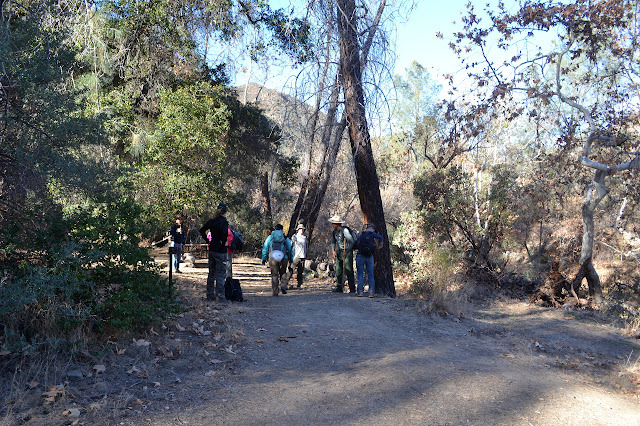 Okay, so the part of Skofield Park that is Rattlesnake Canyon is an inholding in the forest and many do not realize it is city, not the feds. But Parma is an island. I walked down to Shoreline after dark to see where things stood that night. The air looked foggy, but without moisture, as I went. Even through the N95 mask kindly provided by the city, it smelled thick and dreadful. When I yielded to an itchy nose, I found out what I smelled with the mask on was just a tiny fraction of all the "amusing notes" in the concoction that passed for air that night. Nothing could be seen from the park through that gritty air. When I got home, my clothes smelled like I had been hours at the wrong side of a campfire. And then there was calm for a day and more calm promised, at least until Wednesday night. 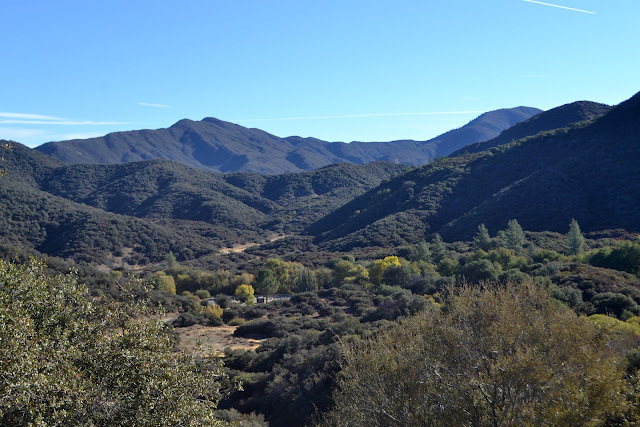 I really had to get away from it all, so I abandoned the cats, hopefully not to too much fate, and drove past a lot of recent burn on 101 and 126 and all the way to Angeles to an unsigned dirt road along Oakdale Canyon Road a few miles from the Old Ridge Route (both N2). The half of the Los Padres next to me is currently closed for the duration. 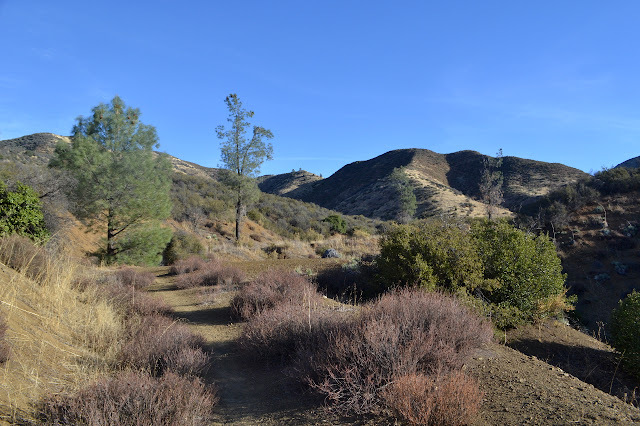 A dirt road at the top of a hill connects to the Pacific Crest Trail. 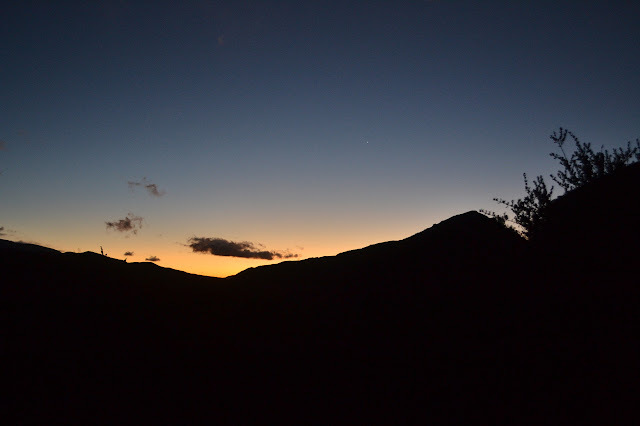 It is time to climb Liebre Mountain. 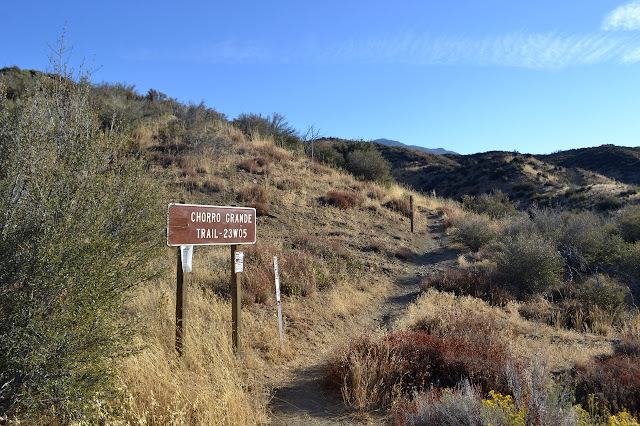 I sort of know the trail because I hiked it from where it crosses Oakdale Canyon Road a mile to the east to up past the camp when I was otherwise in the area and still had the whole afternoon. I noticed the road then (although there are clues on area maps). 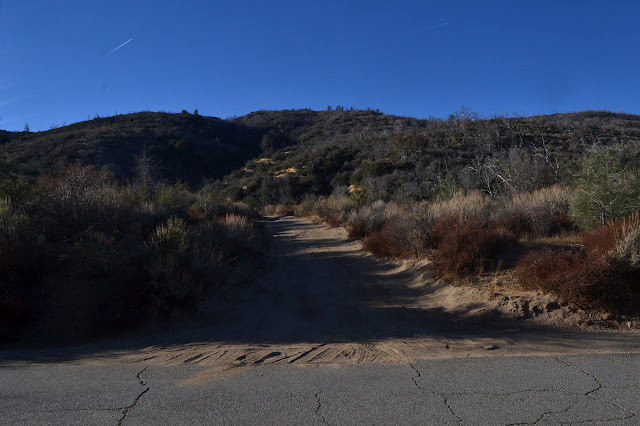 I could probably have rolled through the eroded bits to the parking next to the trail, but there is plenty of parking on the road and the Hundred Peaks Section guide finishes the driving directions with 0.1 miles on this road, so I did not see the point. After what probably is not even 0.1 miles, there is the trail just as I remember it, passing as a tangent to the oblong parking area. Taking a right, I pass a sign that is slightly more meaningful to me now. 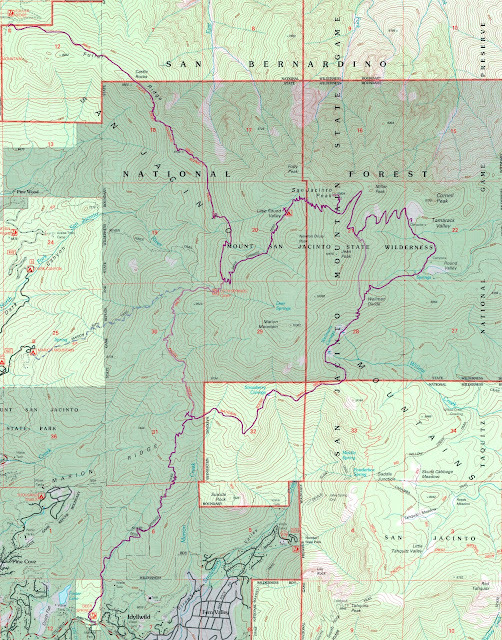 It is 10 miles to Sawmill Campground, where I camped last time I played around this mountain, and eight miles to the Atmore Meadows junction where the road at the top was closed. Yeah, this peak can be a drive up. Past the sign, the trail begins to climb. Looking across the rift zone of San Andres to Tehacapi on the left and random bumps in the flat on the right. 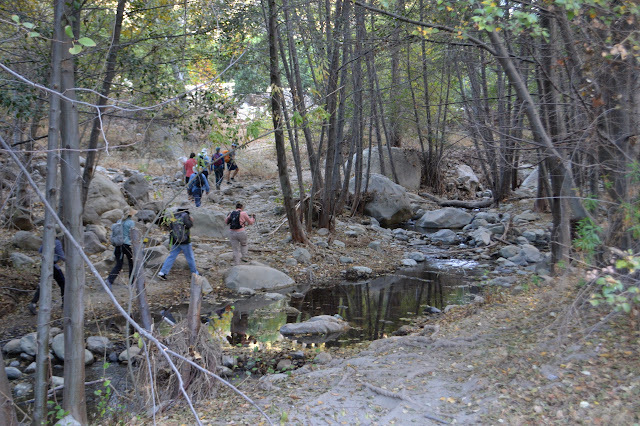 The blurb said a hike down to Forbush Flat and then 1.5 miles more to a natural spring. Cryptic. What could it mean? If they head down Gidney Creek, it would be somewhere I have not gone before. Maybe they would hike up the creek and it is that far to the spring that should be feeding Forbush Flat? That seems rather long, but I have not done it and with enough twists, maybe it is. It is rated strenuous for just six miles. That could mean off trail or just try to discourage those who might get in trouble with the "upside down" hike. Most likely, they mean the travertine pools. It would be easy to ask, but also easy enough to sign up and get to either see the pools again or something new. Up toward the top and heading down. A beautiful day for it. The loose cliffs of Little Pine Mountain are looking especially stark today. 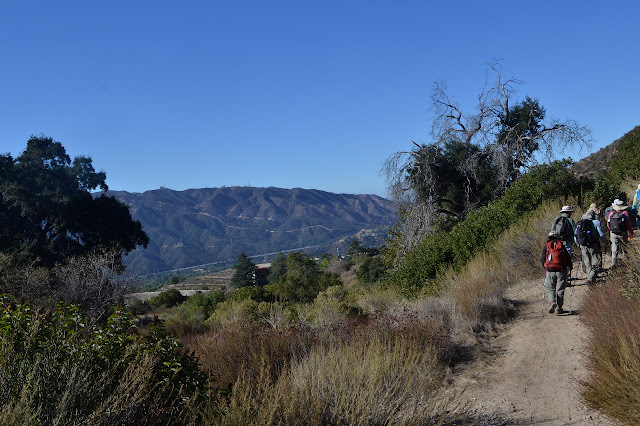 There seem to be certain trails that attract a class of thoughtless hiker that acts like the greatest value the place they are hiking through is as a land fill and tosses their trash off to the side as they go. 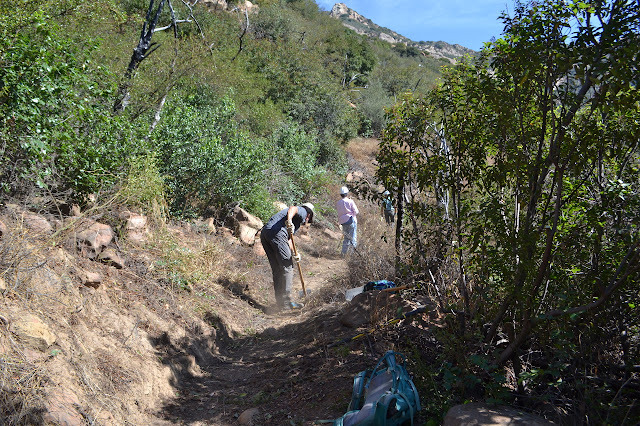 Unfortunately for Santa Paula Canyon, it is one of these trails, so Los Padres ForestWatch organizes regular clean ups along it. And for the volunteers, Figueroa Mountain Brewing has provided free beer. This is not so cool because it comes in the form of a coupon that is only good on the same day. They have also provided bags. This is very cool because they are former grain bags and are tough enough to take on lots of broken glass tossed within and plenty of thrashing into bushes on the outside while being a reused item. We will have no trouble tackling whatever trash comes with these. After signing three forms and listening to a safety lecture, we are ready to head out to the trail. First, there is the paved hike through the college. Handy frequent signs direct us along the way. Hiking up the road through the college with our grain bags tucked away. The group is split into two at the start. 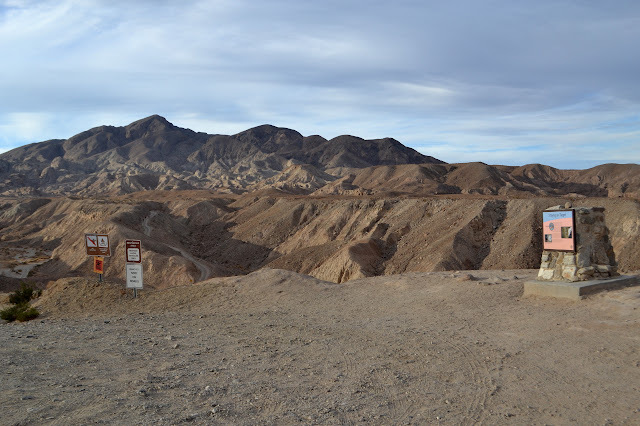 One will head all the way to the campgrounds near the punch bowl, then pick up around there and on the way back. The other group will do the trail closer to the start. Almost everyone seems to head off in the first group going for the further hike. 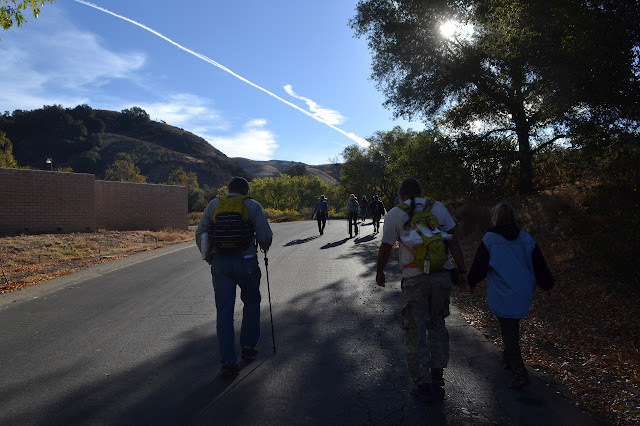 Together, we walk the paved roads, past the oil wells, around more oil well, and finally into something like nature down into the canyon and across the creek. It is quite full with water. The trail beyond is well traveled and easy to follow. The difficulty really comes from all the options. Still, it seems likely that all the options get there too. The night was already colder than expected when we went to bed, so we were slightly worried. Somehow it did not get much colder and was already getting warmer by our sunrise wake up time. Pudding again for this morning, in "special dark" chocolate. The shaking elicits an, "It's loud," from my neighbor with just a touch of animosity, so I yield to the thought of pulling on my shoes and going back to the top of the mountain where the sunrise will be better. Such is life. We are out just about on time for the four rolling miles out to Rabbit Peak. Good morning star shine, it is time to boogie. Shedding a bit more elevation before the higher peak. The hikers gathered at just the right crossing of Truckhaven and S22, the latest coming in at midnight, to camp and get a mildly early start in the morning. Who would have thought the state park would allow dispersed camping? Just have to keep it within one car length of an established road. I give my banana pudding* a nice, long shake and put it aside in the cool morning air to refrigerate before carefully examining my foot for even the slightest glimmer of pain. No motion seems to set it off, so I get to wear my trail runners. It makes me feel safer to have a bigger range of movement on a wild "trail". I get some hot chocolate together to go with the banana pudding and scarf down half of it before getting a rather loud full signal. I head over to the actual meet point. We get signed in and extra sure that everyone has enough water. My brain keeps grunting that this will be a particularly heavy pack until a change of perspective. 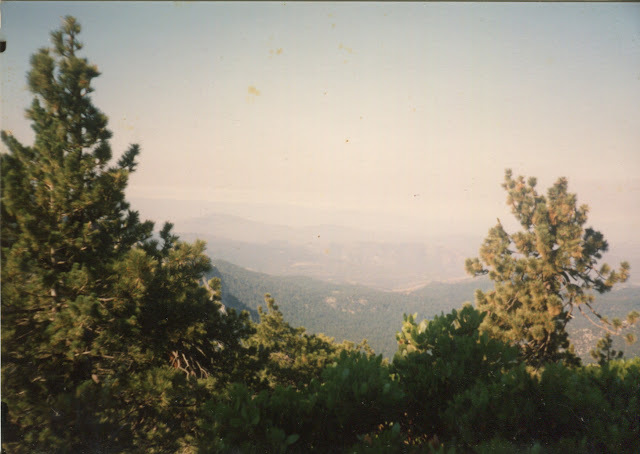 I have often gone out into the Sierra with 20 pounds of food about about 5 pounds of water. Swap those and it is about what I have today. Nearly 20 pounds of water and about 3 pounds of food. This is a perfectly ordinary pack and this weight will disappear faster. Folks camped out one side of the other of Truckhaven Road. Ryan came over to say we would be going up that smooth ridge on the left to start, but the rest is hidden. 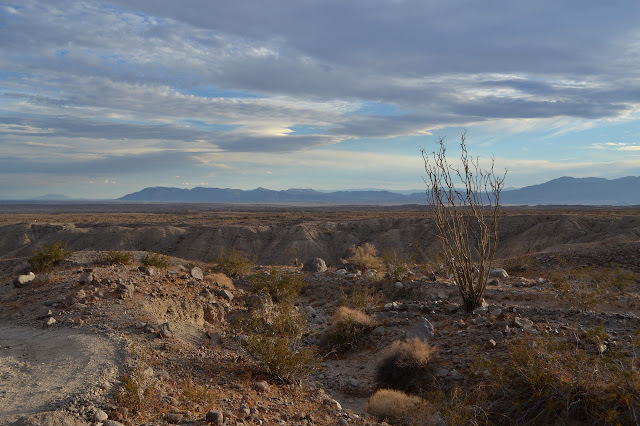 We start off across the flat desert on a well established and initially very sandy use trail. It is glaringly devoid of the slot canyons I was hiking past yesterday and was expecting to see more of. The scattered rocks look rather volcanic. There are more hints we are walking over different geology as we pass by ocotillo that is bursting out with enough leaves to hide the wicked thorns along their towering branches. We cross a wide and shallow wash just before we start our climb among granite. That is definitely different from the sedimentary rocks yesterday. Is it the season for the ocotillo to green? Travelers Peak is probably the slightly higher and slightly further point on the right. 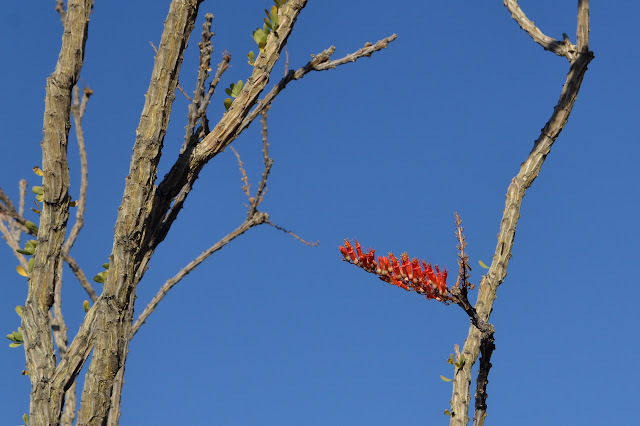 A few ocotillo are even in bloom. I signed up for an overnight backpack way down south and since getting there involves driving halfway to Phoenix (well, 20 miles short of) and then turning right to drive some more, I decided to leave at a time that might not have as much traffic and could give me time to hike at the end. Just a few tens of miles of slow curd around the 405 and one complete freeway stoppage later, I have arrived at the start of a road to an old calcite mine and a good approach to climbing Travelers Peak with an hour and ten minutes to sunset. It is plenty of time to check out the mine, but probably not enough to head up the peak. I had rather hoped this would serve as a shakedown for how my injured foot* is doing and if I can get away with wearing my soft trail runners instead of my immobilizer boots for the overnight. Getting into the scramble up the mountain would be better for that than the road walk to the mine. Of course, maybe I can drive the road. An interpretive sign about calcite use in gun sights marks the beginning of the road to the mine. Travelers Peak rises up behind a bit of the local badlands. Heading down to the wash and less than 400 feet down the road, it is clear that had I started down it in the car, I would just be backing right back up it to park beside the sign. There are three guys coming down the road on the other side of the wash. This is odd as there were no other cars parked near me. As I get to the wash, they have climbed into a Jeep with big grippy tires and plenty of clearance that is parked in it. Just one big bump and they give up? Up the other side, there is a little more plateau to walk along toward the mountain. 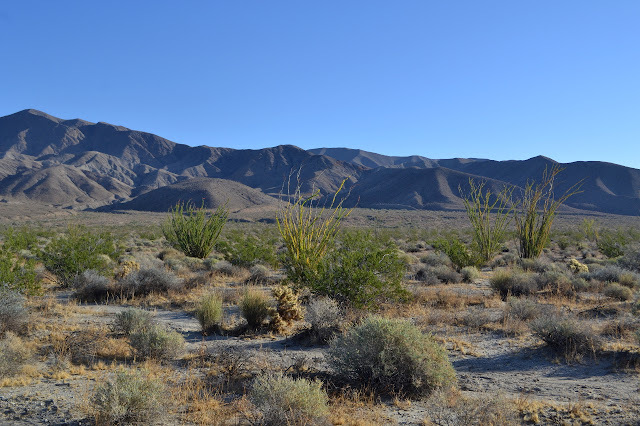 Out among the ocotillo and looking back over this plateau broken by a few washes. A road heads off to the right with a little sign next to it. Palm Wash. There was a well used track heading off in the bottom of the wash, but it looks like this road is official. I follow past the Calcite Mine sign instead. As it starts to climb, the immediate scenery gets quite interesting. 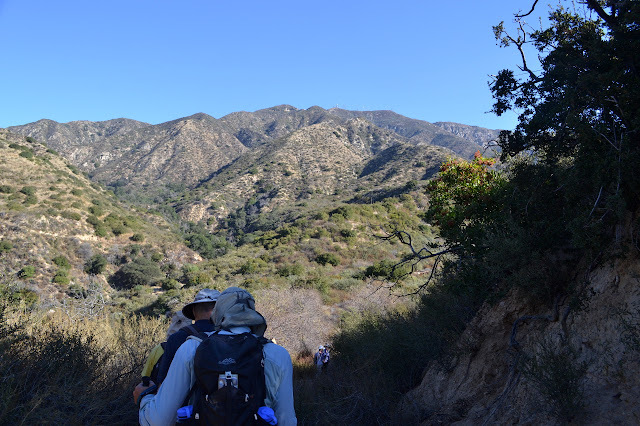 I have never hiked with the Ventura Sierra Club and thought I might when I noticed they were planning a hike including Howard Creek, a trail that has so far escaped my stomping. They arrived punctually in another part of the parking lot for the carpool, but eventually the two of us who were misplaced got found and everyone was piled comfortably into three cars. Upon arrival at Howard Creek Trailhead, we dropped off one car and continued a little less comfortably to Rose Valley Campground. Hiker parking is just outside the campground gate. Even down in the valley bottom, views already look good in all directions. But it is cold. 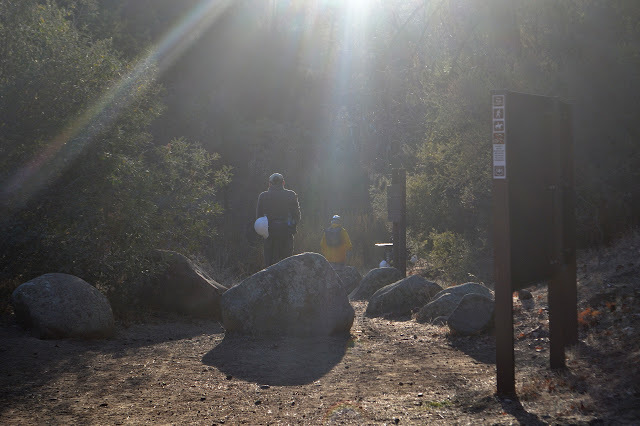 All these campgrounds tucked into the north side of Nordhoff Ridge seem to be good cold sinks. 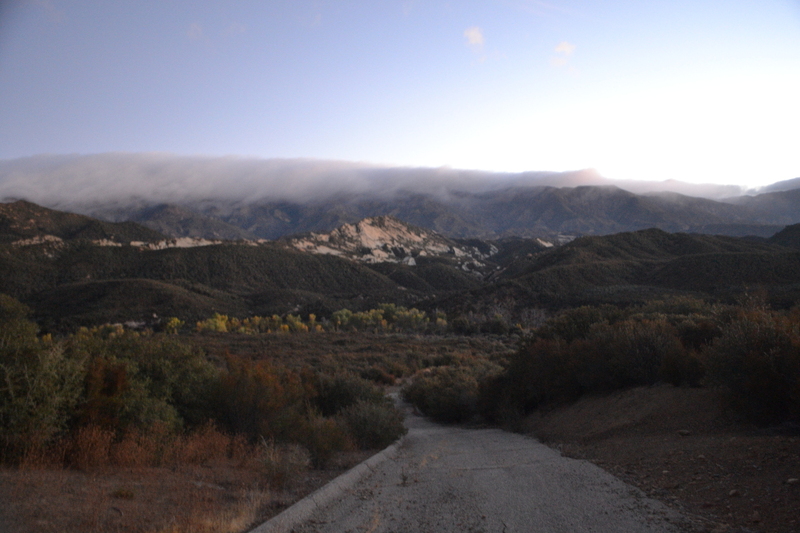 The day looks good as we start up the road through the campground and out of Rose Valley. The waterfall looks like it might be a little wet or maybe just a little shadowy. We keep right as we walk through the camp and quickly come to the locked gate and the start of the climb. It is hard to tell if we warm more from getting out of the cold pocket that is the bottom of the valley or from the work of the climb, but everyone who was dancing and shivering when we started is now stripping off any extra layers to get more comfortable. We have to dodge one car coming down as we climb. 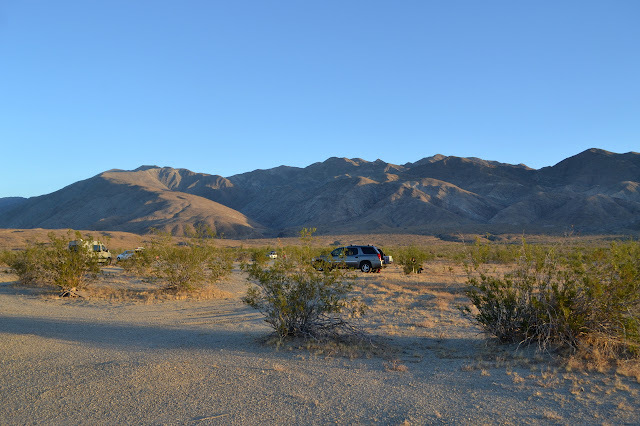 The road may be locked, but there is a set procedure for gaining permission to pass through and a few fun campsites at the top that people like to stop at. Looking down on Rose Valley Campground where there is most of the fall color to be seen today. 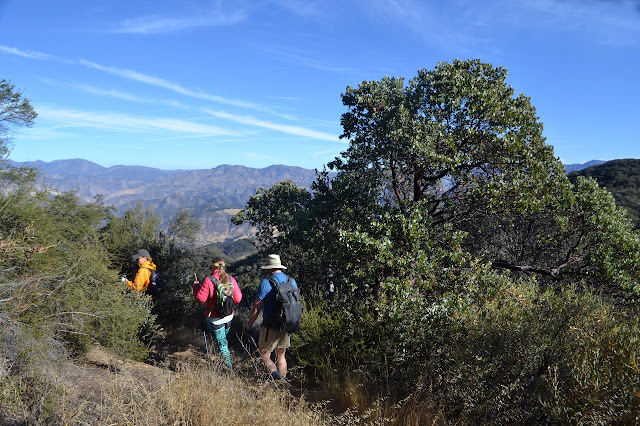 I came out to join a group of peakbaggers from the Hundred Peaks Section hiking to the high point of the City of Los Angeles. I thought that when I crossed into the city way out at the 5 and 14 split, I would not be out of it again until late afternoon, but I seem to be standing in the City of Glendale as everyone gathers up. I expected a large a-lot because it is Bill's birthday, but there seems to only be a small a-lot of just over 20 for the hike. Bill says he met his wife hiking this peak, so now we know why it is special to him and why he wanted to mark year 70 here. He is a bit of a romantic. Getting everyone together, waivers signed, introduced, and starting down the trail seems to get done fairly quickly. We hit the trail and start climbing just three minutes after the meet time. Admittedly, it was a very easy meet time to make. Hang a left and start to climb. Quickly gaining city views and the 210 and the Verdugos with their antenna hair and fresh fire scar on the north end. Take the switchback and we overlook Dunsmore Canyon, which looks like it handles huge amounts of water in sudden bursts. Our destination ahead. Mount Lukens has a little antenna hair also. After a short climb, our trail suddenly turns downward and tucks into a narrow canyon with a clear liquid flowing down the middle of it. The mythical water that has a 20% chance of coming down on our heads. Most hop across but some splash through it. There is a brief moment when the trail is carved into a cliff as we climb out the other side. It is more daring than we had expected! 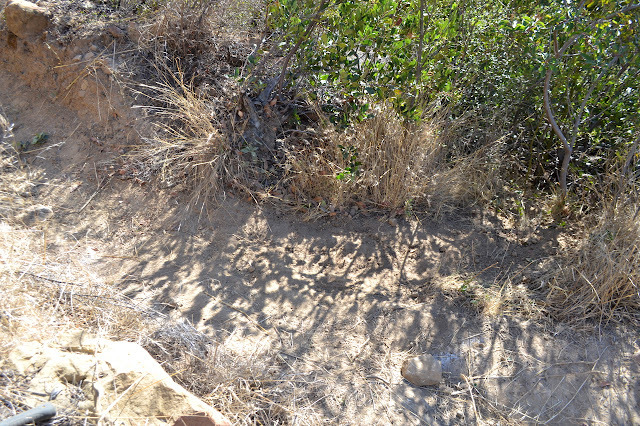 As we continue, there are a few small slides on the trail and overgrown bushes above the trail set to see if they can get us off and down the side at a few choice steep spots. The group piles up a little at a couple, but nobody pauses very long for any of it. Stopping above the spring that POURS out water. Fall color trip, but my gold watercolors weren't in the collection today. I could not help noticing a bit of fall color as I drove up the 33 last week. 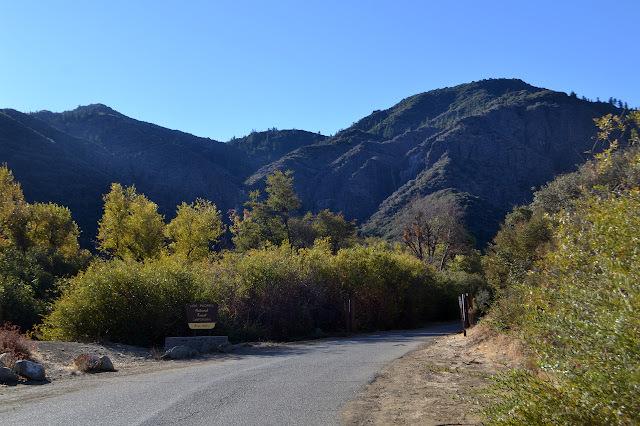 I had sort of been wanting to do Middle Sespe once some water gets flowing, but decided bright yellow cottonwoods might be a good excuse to come see it too. It keeps escaping my notice because it seems to parallel the Sespe River Road, and what would be the point of hiking that? I find a turnout about 250 feet past the nearly unmarked trail, or at least 250 feet from the coordinate I have for it. It would have taken a lot of looking without the GPS, especially in the dark. I decided I should treat light like it is important to me and get to the trail as the dawn was breaking. It is a little earlier than planned, but that just gives me time to get my shoes and sunscreen on. There is just barely enough light to walk by once I am ready to hit the trail. I head back down the road to the waypoint. Dirt and rocks have been piled up on the old road down into Beaver, disguising it as just another bit of road edge. 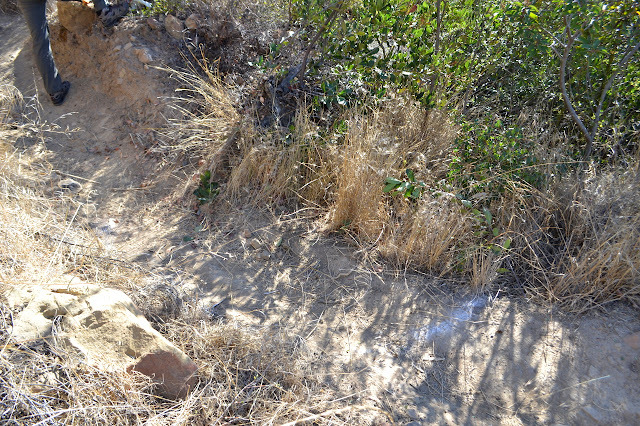 Between the piles, a slapstick marker has been placed with an arrow and the words "TRAIL MIDDLE SESPE". Behind it is pavement. There is even a curb on one side. A long exposure fortuitously held steady shows a bit of the color I am coming for even if it is not quite light enough for my eyes to see it with certainty. A more accurate representation of the light level as the sun chases a bright planet up into the sky. Clouds are rolling over the mountains to the north. Much of the area well past them is expecting a storm today. I am hoping it will bring cooler air, but promises of low 70s for the high today made last week turned into low 80s as the day got closer. I was only slightly cold as I got out of the car and am quite comfortable now that I am moving. I threw two water bags, ten pounds of water, into the pack to try to be prepared for what the trail has in store for me. Presently, it is more piles of dirt and rocks on top of the pavement with a route around the side. On the far side, the road has turned to gravel. The trail does not rejoin it, but crosses and drops down a hill beside it. It looks like it skips the old campground that used to be its western terminus now. 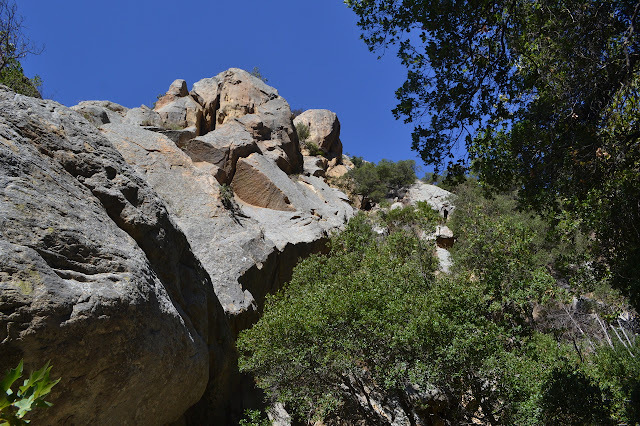 I was wanting to go up the canyon again but also thinking it is more of a social hike when I noticed it was also about the be lead by the local Sierra Club. Perfect! I can just show up and wander up with them. I was a little worried that it might still be a red flag day. It was Friday evening and those of us who noticed had an extra mile to hike up the road while those of us who did not came back to find the CHP had plastered warning stickers on everything a little after 7PM. The sign warns of towing, so it could have been worse. Today is not so bad except for the usual crowds. I get lucky because everyone is passing up the spot on the end because it looks too small. I go ahead and try it with the dinky car and it fits with a few feet to spare to let the Florida plates in front of me get out. Others are stuck walking a half mile up anyway, mostly because the turnout that is big enough to take cars head in is entirely parked parallel. Ah, life at the Tunnel Trailhead. Of course, since Tunnel Trail is actually Tunnel Road, but behind a gate, we still have most of another mile on pavement before we get to some dirt. We turn left on the catway to get up to the start of Jesusita and finally a little bit of trail. We are only on it to the bottom of the creek when we turn off the official routes and start in on the heavily trafficked use trails. Mission Creek is so dry. There has not even been a lasting mud puddle for a while. We should have one more coming who said he would "catch up" after going to park. We wait a while (well, I wait a while) but eventually the leader says he has too many people to keep waiting. I am fairly sure that is not how hiking with a group works, but the mistake was probably made at the start when we let someone try to catch up. Now everyone else has gone on ahead and our missing hiker, who at least does know the local trail system, will not get to come up to the pools because that is the part he does not know. Looking back over the trail as we climb, I still do not see him. The canyon is quite full of big rocks. 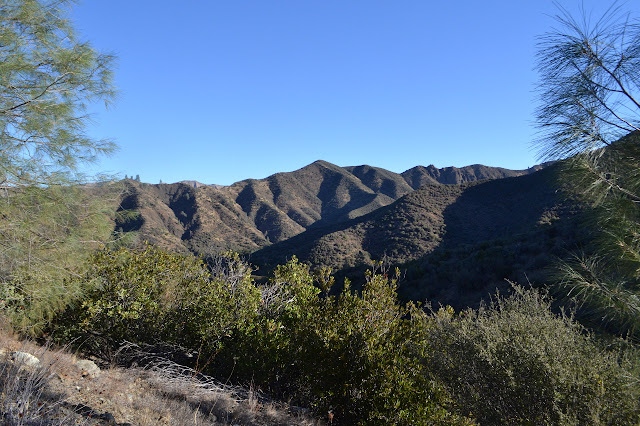 We keep to the spine of the ridge for a short way, then take the flatter trail at a junction near a lookout rock. The other trail can be taken to climb all the way up to the peak above. We have a much daintier destination. The level trail drops and climbs in short, steep spurts as it decides it should have more character. Much of it seems to be chipped from the rocks although there is not supposed to be a built trail here. 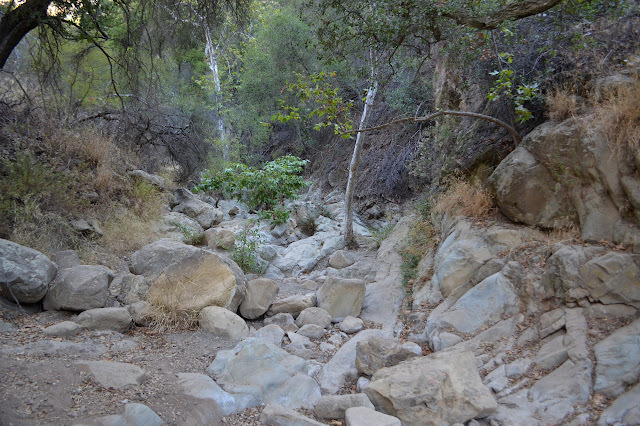 There are some mildly precarious moments as we cross above the Seven Falls and then drop into the creek. I had sort of wanted to try coming directly up the falls, but that was not the plan for today. 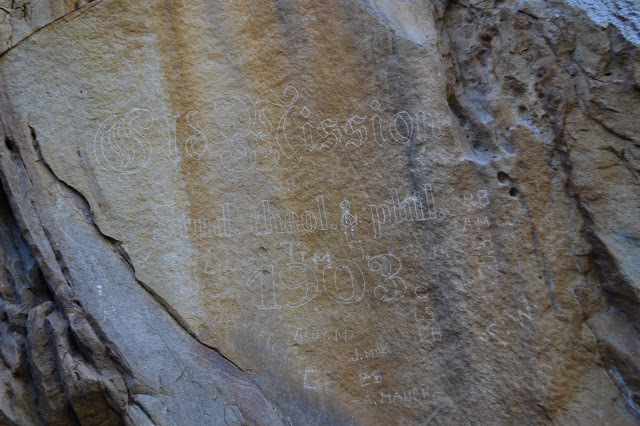 Graffiti in the canyon. 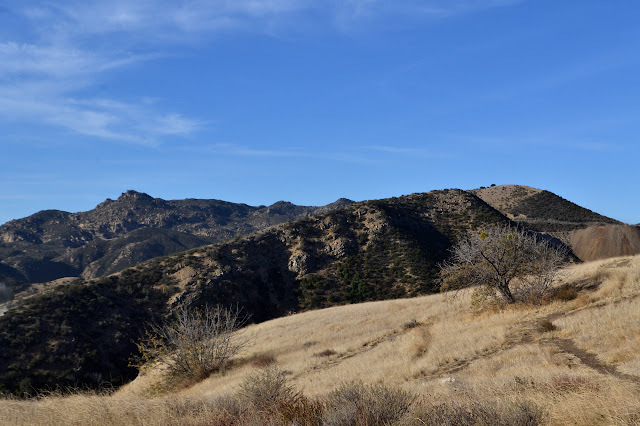 There are supposed to be three of these, one on La Cumbre Peak and one in the hills above Flores Flats. There is not much patina in the letters, but there is not much on the rock either and the letters are a different color than Tim's addition. When I first hiked up Chorro Grande, I found myself crossing a road and as I climbed further I noticed it was quite obvious and fairly clear and generally not falling off the mountain. I checked my map and there it was. The far east side stops near a spot that simply says "spring". Ever since, I have been meaning to check it out. Years passed, a fire burned the lower section closing it shortly, another couple years passed. It is certainly about time that I actually did it. Not only that, it seems like a while since I have done something exploratory. 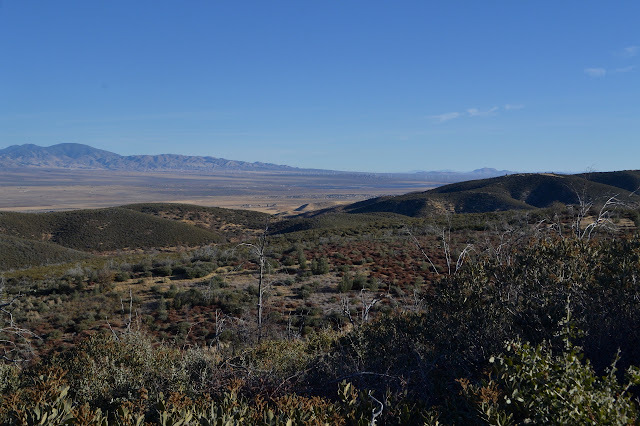 I did get disheartened when I saw a geocache log saying it would be a long time before anyone followed that road again, but there is an easy plan B to be had: just stop by the Ortega benchmark and try to work up from there. So now, I am once again at the bottom of Chorro Grande, but only meaning to go up halfway. The bottom of Chorro Grande Trail. The road sign is not placed to be easily seen from the road. The trail looks pretty good for something that got hit by fire. They do not seem to have closed it for very long, so it would have continued to have feet on it. That generally helps as long as the feet are good about staying on the trail. There is quickly a section with a bit too much slope, but then it settles back down again and stays nearly flat. Where there is brush, it creeps in from the sides, but nothing is difficult to pass. It is the same trail it always was minus the few things that were slightly taller than myself. The band of upturned light rocks remains picturesque, though visible from more places, and the waterfall they create is still quite dry, though water will come. 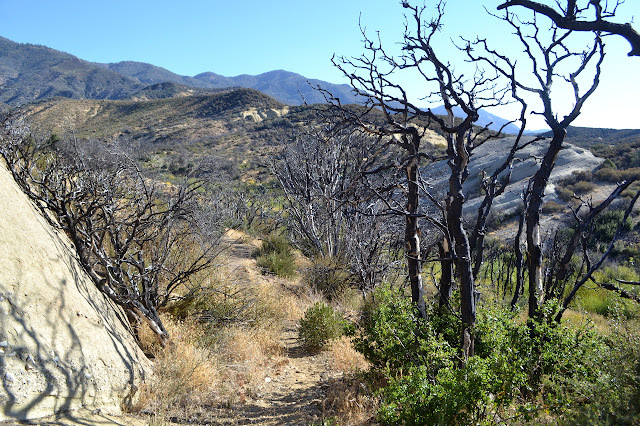 The black is falling away from the burned scrub oaks as they regrow from their roots. Camp Mountain Meadows, up near Isabella Lake, had a wonderful backpacking program, but I had already gone there for two of their backpacking units. Probably as a change of pace, I decided to try out a new camp. 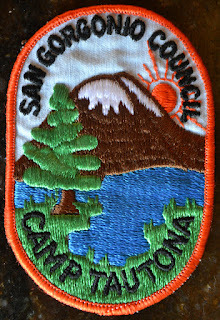 Camp Tautona should have a good program as it was one of the many organizational camps on the north side of San Gorgonio with access to the wilderness in a drive of approximately 5 minutes. There were only four of is at first and we were collected in with the CIT unit for general stuff since they were our age. There were an even dozen of them. They were given an option to join up with us and we got two or three more from that. The camp was different from the others I had been to. We had concrete platforms with roofs that we could put the metal cots on in bad weather, but would usually had them out under the stars. At Mountain Meadows we only had our backpacking equipment and at Tecuya we were told to bring tarps to throw over ourselves if it rained, so that was fancy. We had bears in camp because the trash was not well kept. (They were working on it.) Dinning was outside and we were to be careful not to drop anything down through the deck because bears would come. (See, they really were working on it.) Dining was a bit more like the boys camp we stopped at at the end of the hike out of Forks of the Kern, except we had a leisurely hour. After eating, the dishes all got washed and slid into a drying bin that was dipped in rinse water and then in bleach and then set into a wooden bin along the back of the kitchen to dry. And then they got locked up because bears. At the other camps, we brought out clean dishes and sent back dirty ones, so that was less fancy. We probably learned some map reading and compass work. 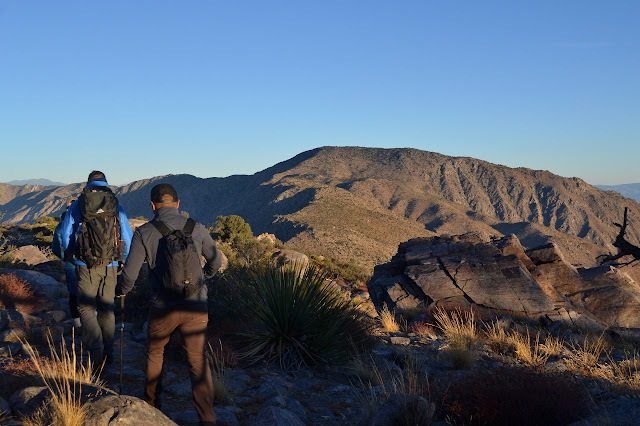 We definitely hiked around a bit with our packs weighed down with kitchen supplies. I more remember learning a working rain song on the wide steps up to the deck where we would sit and sing camp songs until the kitchen was ready. That had real consequences whereas I had already learned my way around a map and compass. It definitely worked. At least the whole camp singing it with glee was answered by a bright blue sky collecting a few clouds right at the end. Consequences. Singing later was answered with a few puffy clouds turning dark and starting to look threatening and it kept building to rain. We moved our beds in under the roofs that night. I already knew that I could, once in a while, snore sufficiently to wake the dead, but that next morning when my throat felt rather like I should believe the accusations being leveled at me, I learned that it can be very difficult to wake me. With the close quarters, quite a nasty consequence for my neighbors. The next night was the night before leaving. We slept in the smaller indoor dining space for some reason. We might have been getting up early to leave and did not want to disturb the CIT girls when we got up or we might have just wanted to make sure our gear stayed dry before heading out into the wilds. Oh, and I tried sleeping on my stomach to try to prevent my snotty nose from becoming a disturbance to all again because someone had said they had heard side sleeping and especially stomach sleeping prevents snoring. It worked, beginning a campaign to learn to sleep on anything but my back. 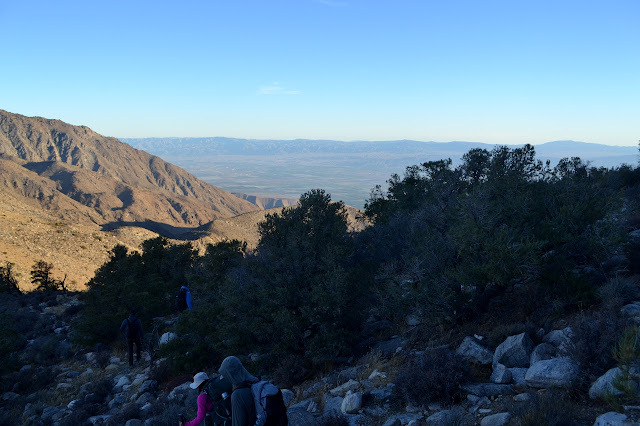 In the morning, we packed into a big van and headed out not to San Gorgonio next door but over to San Jacinto. 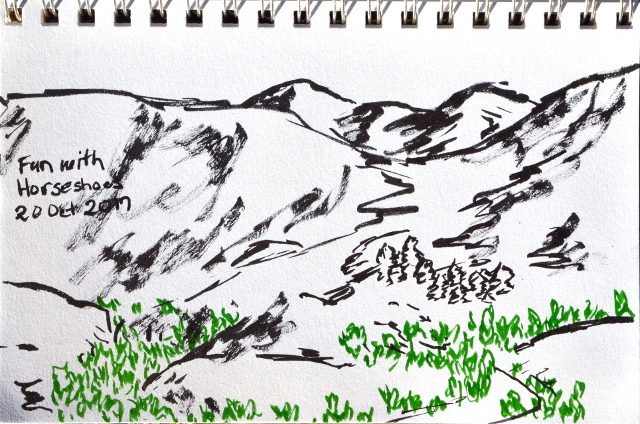 Specifically, we headed for Fuller Ridge, the north side of the Pacific Crest Trail (PCT) as it passes by the mountain. Area map and estimated route. The map is a piece of the San Jacinto Peak 1996 7.5' USGS topo. This old map is more recent than the trip. The plan was to hike Fuller Ridge to Little Round Valley. We arrived with no fuss at the trailhead to start down the PCT. While I had known the John Muir Trail (JMT) as a ~3 week extravaganza by this time, this may well have been the point when I noticed the PCT existed outside of the Sierra and was actually a rather long trail stretching from Mexico to Canada. It was some time in high school that I realized this and that there were a few people each year who hiked the entire length in one go. There were 33 people who completed it in 1992 and recorded their effort with the PCTA. I wanted to do all of the JMT at this time. 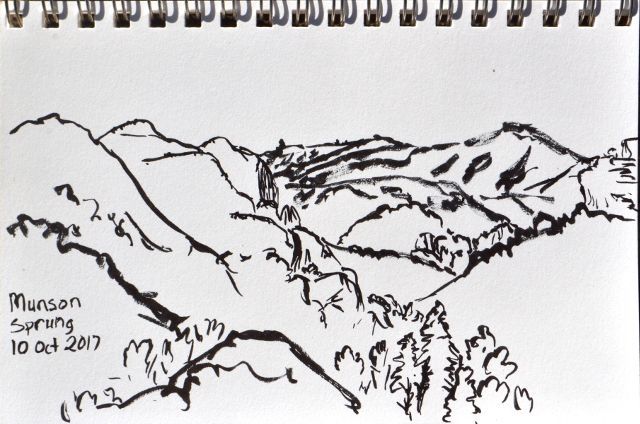 Perhaps it was Fuller Ridge that helped snuff out any spark of desire to do the PCT from end to end. A view from Fuller Ridge. (Probably.) It was sunny again. I think the camp promised not to sing the rain song while we were out.